feeding right. Early morning and late afternoon remain the best time to get hooked up on these guys. This is shaping up to be a great year for Bone fish both east and west of Key West with many being caught over 7-9 pounds. When fly fishing small crab patterns or shrimp patterns in light tan have been working the best. The Permit are out there too, they have been just a little tougher this year than normal. With these guys crab patterns such as Merkins and Yarn crabs are a must. If you are on spinning gear, live crabs will work even better. 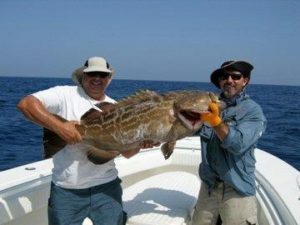 Offshore has been good for deep jigging Grouper and Mutton snapper over sea mounts and deeper wrecks. The Dolphin are out there, but many Captains are having to venture out a good distance to find them. The yellow tail snapper fishing has been excellent just outside the reef line in 60-100 feet of water. Tuna, Wahoo and Mackerel are just a little further west of Key West at the end of the bar. Remember to be safe and aware of the weather when venturing out. Good Luck!